In the wake of the Royal Commission into Institutional Responses to Child Sexual Abuse, Sydney’s Rabbi Selwyn Franklin became interim president of NORA, the New Organisation of the Rabbis of Australasia…a post he will not contend at NORA’s inaugural conference. Nora has issued the following statement: “NORA is presently operating only as a steering committee in order to co-ordinate the reformulation of the rabbinic association of Australia to ensure that it meets with contemporary standards of governance and accountability. The steering committee is directed solely to that task with a view to a new rabbinic association becoming operative after a conference of Australian rabbis planned for June in 2015. Rabbi Selwyn Franklin’s role as interim “president” has been to co-ordinate the various tasks of the interim steering committee. Rabbi Franklin does not intend to be a candidate for the position of president of the newly reformulated organisation. It has been suggested that Rabbi Franklin ought not to continue his present function with NORA because of his role as vice-president of the KA in light of conclusions reached by the KCI operating under the auspices of the Board of Deputies of New South Wales. Those conclusions are disputed by the KA and the competing contentions of the KCI and the KA have been ventilated publicly. In the present circumstances, the interim steering committee of NORA is simply in no position to evaluate the merits of the competing claims between the KCI and KA. Since the publication of the KCI report and the KA response, Rabbi Franklin has been travelling overseas to meet commitments in South Africa and Israel. He has not yet had an adequate opportunity to consider those reports, consult with relevant people and seek advice so that he can give due and proper consideration to his position and whether it is appropriate for him to continue in his interim role with NORA. Rabbi Franklin is scheduled to return to Australia after Pesach and will then have an opportunity to give adequate consideration to the matter. With the benefit of that proper consideration, Rabbi Franklin will then make a decision regarding his continuing role with NORA. 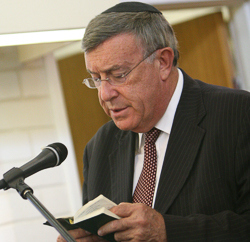 NORA was formed after Rabbi Meir Kluwgant, the former president of ORA, the Organisation of Rabbis of Australasia resigned following evidence presented at the Royal Commission.